(e) if there are multiple Venues for the Match, the format will be announced before or with the announcement of those Venues. 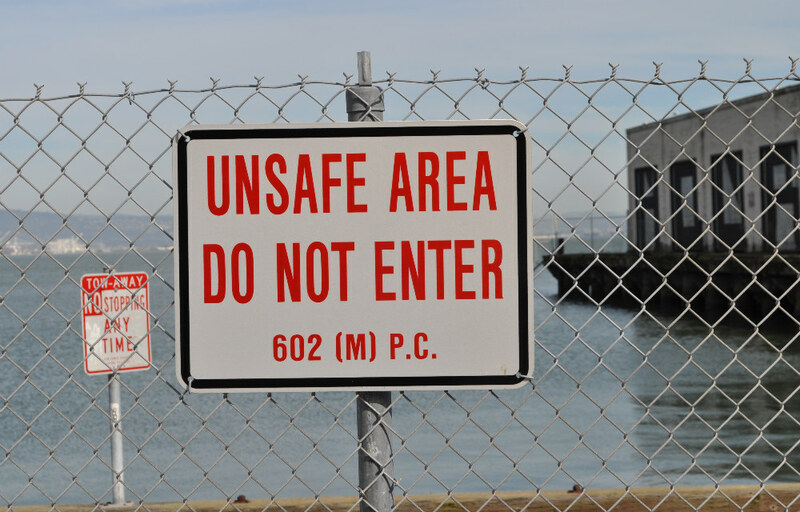 The way I read the tea leaves, this improves the odds of running the 34th America’s Cup match on San Francisco Bay—in 2013, not 2014, to my surprise—because it frees the organizers from dependence on this piece of infrastructure or that. 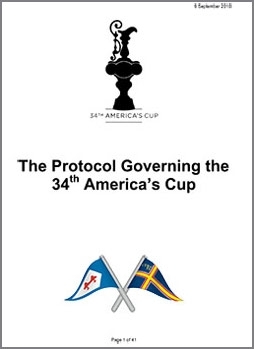 The Protocol creates a World Series of America’s Cup sailing, with the AC Match as the centerpiece, and once you have a traveling road show, you have options. I don’t mean to suggest that the City of San Francisco is off-note with Mayor Gavin Newsom’s proposal for an ambitious overhaul of the southern Embarcadero. 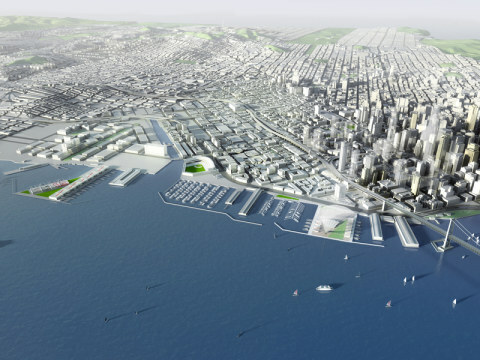 The teams want it, the waterfront needs the overhaul, there’s no other prospect out there for getting it done, and San Francisco partisans should not let the conversation be driven by worries over the next 75 years of usage. A grand, fully envisioned, fully realized America’s Cup village requires solid concrete pads topped with temporary structures. When the AC is gone (not soon, we hope), the city will be the better for having sound, revitalized infrastructure, and then we can have that conversation about the next 75 years. It’s a better look than what we see now . 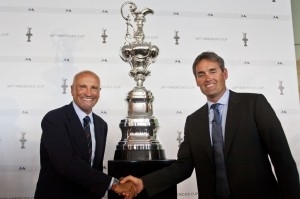 . .
Let’s defend America’s Cup in America. 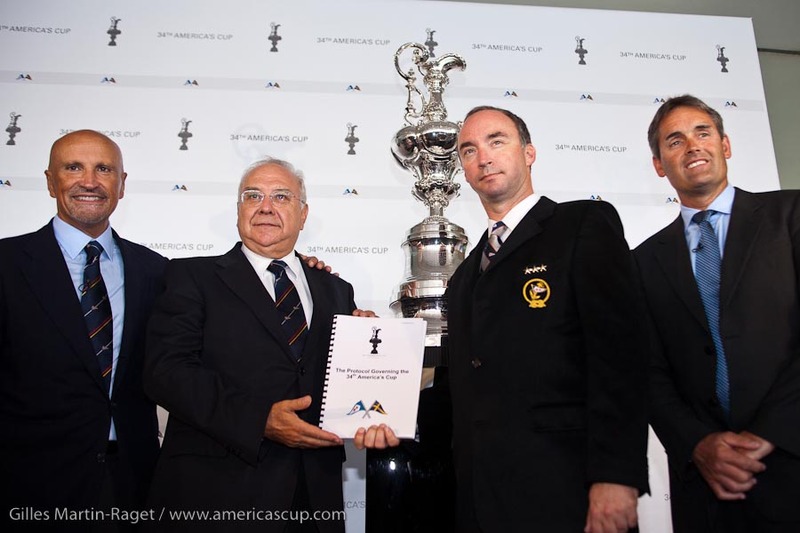 Monday’s press conference, streamed from the BMW Oracle Base in Valencia, Spain, included the formal signing of the Protocol by Commodore Marcus Young for the defending Golden Gate Yacht Club and Commodore Claudio Gorelli for the Challenger of Record, Club Nautico di Roma. I hear a message that, regarding venue, nothing is a done deal. But I see the Defenders doing what they can to bring the Cup match to San Francisco Bay. BMW Oracle Racing has a prototype one-design 45-foot catamaran under way now, the first of a fleet of boats intended to launch the new regime. These are starter boats, if you will, to be raced in three events in 2011, and you can bet your bippy that San Francisco Bay is a strong contender for one of those slots. The plan is for declared teams (“at least eight challengers” according to BOR CEO Russell Coutts) to race against each other in the 45-footers through March of 2012, while they are building their 72-foot America’s Cup contenders. Subsequent racing moves to the 72-footers, with seven regattas in 2012. And yes, there are potential candidates for a Defender elimination series. The 45s will fit inside containers. This, Coutts said, “Provides an elegant way to address moving the fleet around to different venues.” The 72s won’t fit into containers, but unlike V5 ACC monohulls, they can be broken apart and air-shipped in 747 cargo planes. Strong consideration will be given to a short first leg, to bring the boats to the first mark close together. “That would mean that the boats would round nose-to-tail,” Coutts said, “so the race could be won downwind, which would be interesting from a competitive point of view, also from a spectator point of view. And if we end up in a high-wind area, a reaching leg would be worth considering because you’d see the boats at peak speed. The 45-footers will eventually morph into “junior boats” on the circuit, but I don’t think anybody will be moving directly from Optis. Let’s think of them instead, post-2012, as a traveling venue for the farm teams. 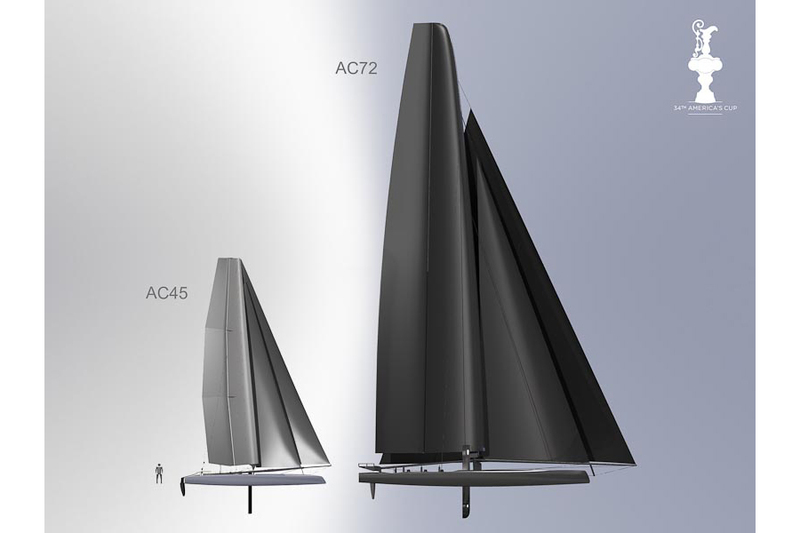 Each team will be limited to building two of the 72-footers defined by the America’s Cup box rule, with a limit of four wings in eight sections, though Coutts suggested that four is an outside number and most teams will probably build only two wings. Being smaller than the wing on USA 17 that won the Cup in February, they will be inherently more manageable and will not require motor-driven winches. It seems likely they will be designed from the get-go to raise and lower easily, or perhaps they will mimic the Harbor Wing prototype, which is designed to pivot freely in two sections so as not to “sail” at rest. The BOR team shares brainpower with Harbor Wing, so there are no secrets there.